Thread: FAQ: How did you treat your bulldog's hotspot? Has your bulldog ever had a hotspot? How was it treated and healed? Did you go to the vet or use a home remedy? Please give as many details as possible and post photos if you have them! Hot spots, also known as acute moist dermatitis, are red, moist, hot and irritated lesions that are typically found on a dog’s head, hip or chest area. Hot spots often grow at an alarming rate within a short period of time because dogs tend to lick, chew and scratch the affected areas, further irritating the skin. Hot spots can become quite painful. Anything that irritates the skin and causes a dog to scratch or lick himself can start a hot spot. Hot spots can be caused by allergic reactions (to either dog food, environment or something they came in contact with), insect, mite or flea bites, poor grooming, underlying ear or skin infections and constant licking and chewing prompted by allergies, stress or boredom. Re: FAQ: How did you treat your bulldog's hotspot? I don't have a photo, and I don't know why!!! But yes, Vegas had a hot spot! I shaved the area and kept it clean and dry with Malaket dog wipes and Vetericyn, wound and skin care, which also cleared up Vegas's cyst that was between his toes. I do have a picture of the cyst. I am wondering why I never took a pic of his hot spot????! No, I haven't had to deal with hotspots yet. I've seen them on here, and have read many threads from members who have dealt with them. I understand they are caused by allergies, and can be difficult to heal. I've read about how others have treated their bullies hotspots, and hopefully if I ever have to face this with my two guys, I'll know what to do. Frank developed a hotspot right before I left him home with my hubby for two weeks while I visited family. My husband told me it was under control but when I came back, it had spread over his head. Because his hair had already fallen out at the areas I didn't shave it. I used Vetericyn Hot Spot Spray several times a day. He always wanted to rub his head, so I was constantly watching him to make sure he didn't. Sometimes I wouldn't catch him in time and the hotspots would be rubbed raw and bleeding. On those, I would clean and dab a bit of neosporin on them at night. It took about a week of diligent care, but now the hotspots are gone and his hair is all grown back. Happiness is a warm bulldog! 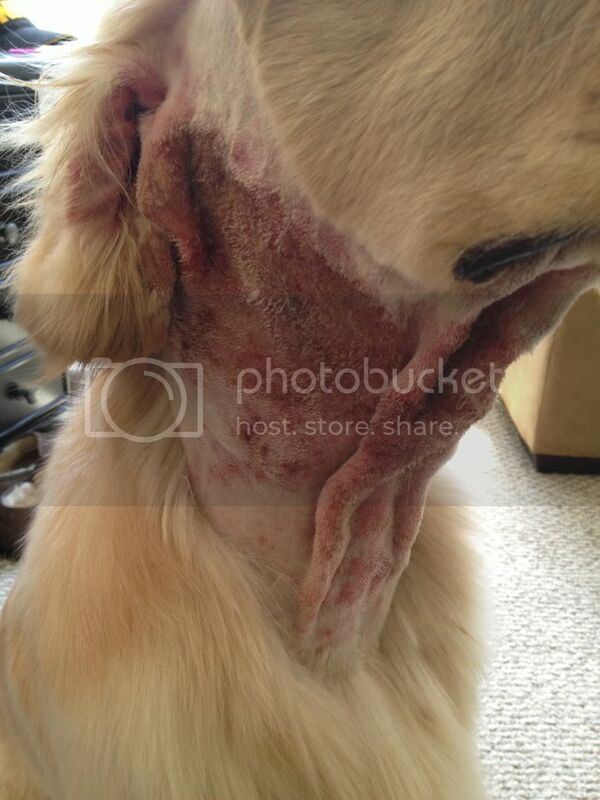 Martha had hot spots around her neck, where the cone had been after two weeks of having to wear it. 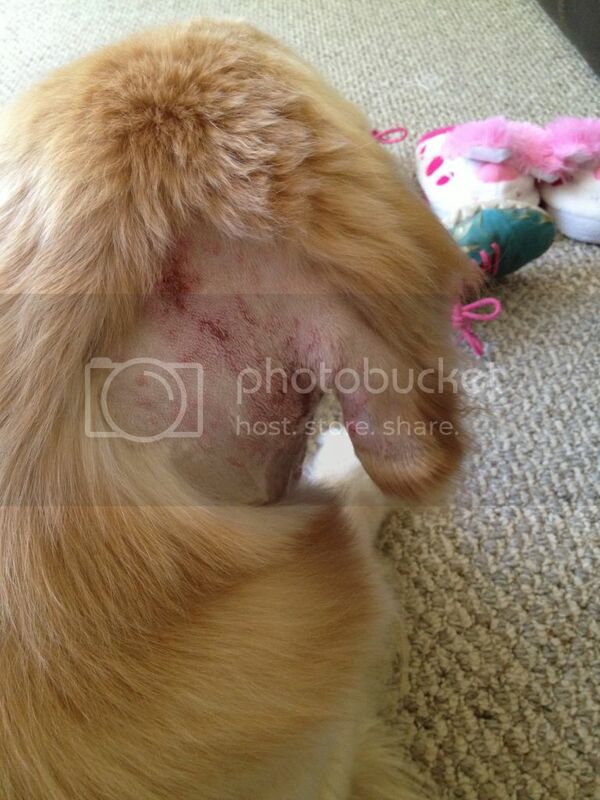 The temp was in the high 90's and even with the a/c in the house-she had sores. 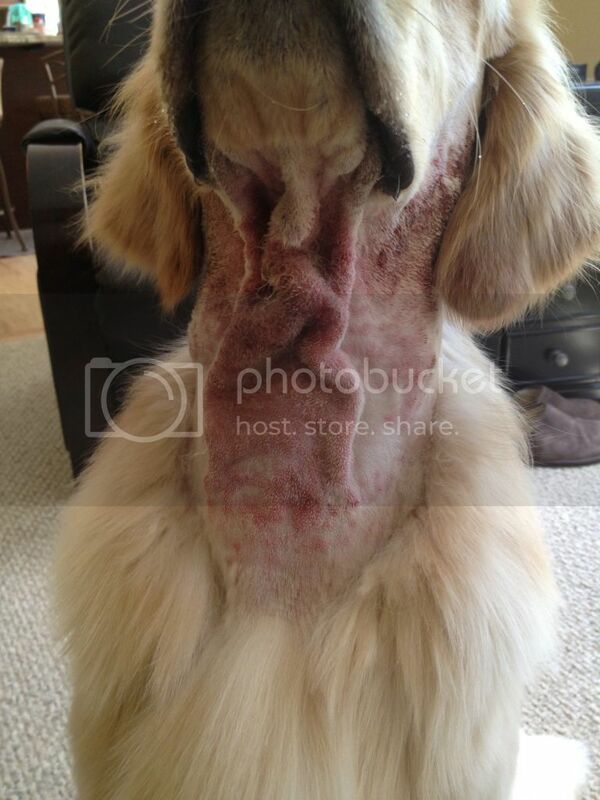 When I finally could take the cone off, I used Vetericyn on the spots, and they eventually healed. Unhappy camper. 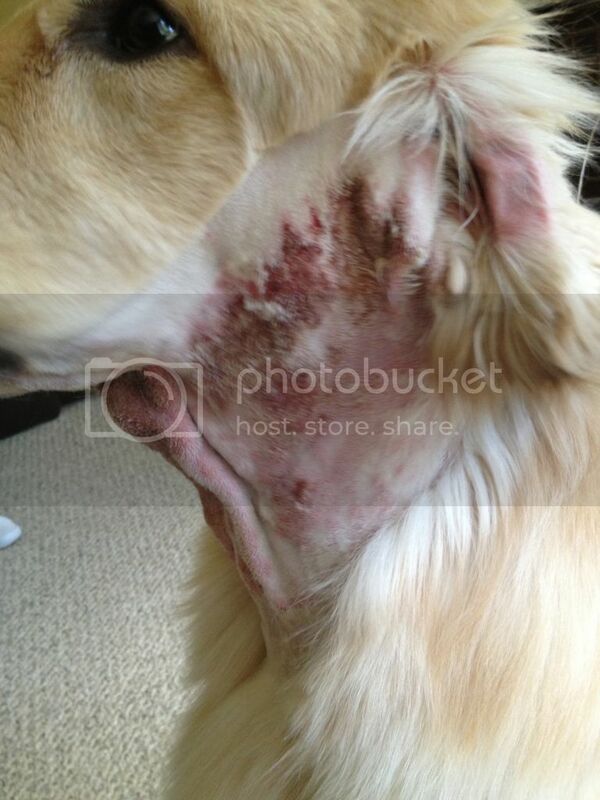 Two years ago my poor Oliver got a really severe case of hotspots. went from nothing to this in about three hours ended up spending the night at the vet. Then the next two days it hurt so bad he tried to sleep while standing up. The best way to treat a hot spot is to shave the area (usually a lot larger than the area looks) so that the skin is exposed as much as possible. Your main objective is to dry it out quickly so it doesn't continue to spread. It is much less expensive to do it yourself that pay your vet, my vet charged me a whooping $400 and I thought, well dang I could have done this myself! I used the same razor that I use to cut hair, not a razor to shave your legs or beard. Then you will need to wash the area a few times a day with hibiclens, (you can get both of these items at your nearest drug store. Walgreens/Walmart/CVS/ect. You can promote healing in between washing and help with itchy-ness by using something that has a mild steroid in it, (like cortizone) and also benedryl will help them sleep and reduce itching. If you have stuff from the vet, stuff that will work would be like animax or entederm. Also Malacetic Ultra has a mild steriod. Ugh,now Maude has a hot spot in her nose wrinkle right between her eyes-from one day to the next. This won't get air,for sure! Now I am being punished for being -a knowitall! Oh my... That us a really tough spot to care for. How did you treat the hotspot in that area? My Chubbers has it in that same area and it seems difficult to take care of. You can use Vetericyn-they have a gel,on a cotton ball,and get it into the wrinkle. I used NuStock(my go-to). It comes in a large tube,and it lasts forever. Good for everything!